"Every morning in Africa, a gazelle wakes up. It knows it must run faster than the fastest lion or it will be killed. Every morning a lion wakes up. It knows it must outrun the slowest gazelle or it will starve to death. It doesn't matter whether you are a lion or a gazelle: when the sun comes up, you'd better be running." Change has come to the internet at an amazingly rapid pace. When we started building websites, it seemed so simple and uncomplicated. We designed a site, wrote content, added images and put it on the web. In a few weeks, without a lot of effort, the site appeared at the top of the many search engines available at the time. In the years since, Google has become the fastest gazelle, the landscape is littered with the remains of all the other search engines and 650 million other websites are clawing and fighting to claim their place on Page 1 of the search rankings. We have to run fast and hard all the time to get your site noticed. The process starts with a thorough analysis of your existing site, your competitors' sites and your goals. We have to figure out where you want to go before we can get you there. Keywords are the foundation of every modern Search Engine Optimized (SEO) website. We begin with an in-depth Keyword Market Research Analysis. 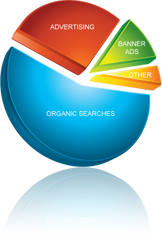 We research your industry as well as your top competitors, and we look at how your prospects search for you on the web. This research drives everything about your website: your domain name, page names and every bit of content on your site. Our sites are completely Search Engine Optimized (SEO) to achieve the highest page rank possible from the start. Yes ... it's a jungle out there, crawling with wannabe Search Engine Optimimization (SEO) and Search Engine Marketing (SEM) predators. Don't be a victim. Let our experts look at your site, listen to your ideas and put together a plan to protect you from the dangers of the jungle we know as the web.